I met up with one of the photography groups I belong to at Santa Cruz’s Walton Light Station for sunrise this week-end. We hoped for more clouds, but the weather changed from cloudy to clear late in the week so we knew it wouldn’t be very colorful, and yet there was some warm color, and a lovely glow low on the horizon as the sun was approaching. But turning to my left looking northeast across the channel there were clouds and some color. “Located at the northern end of Monterey Bay, Santa Cruz Harbor is a haven for fishing craft and vessels. A harbor light, located at the west jetty, has marked its entrance for forty years. The original light was a box light structure which served from 1964 – 1996. It was replaced by a cylinder nicknamed “the water heater” which was used from 1996 – 1999. From 1999 until May 2002, a simple pipe structure held the light which marked the way into the harbor. 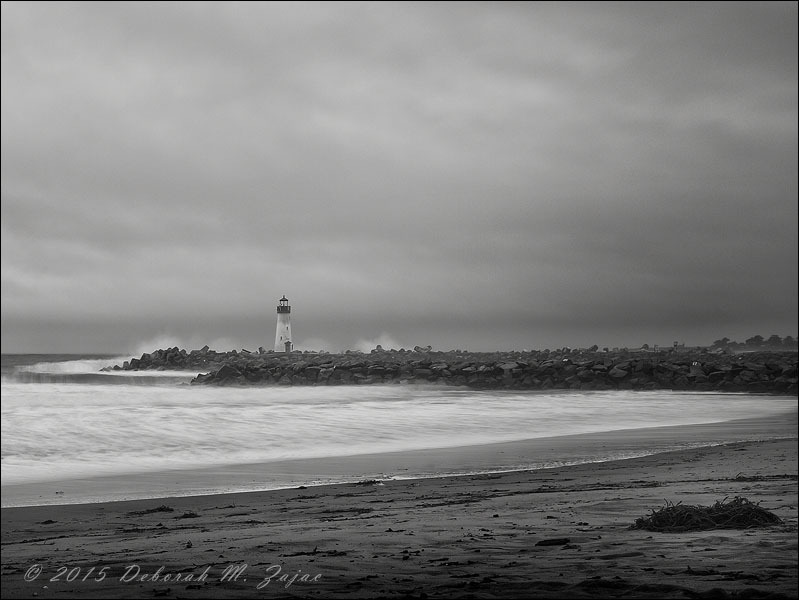 In 1998, the Santa Cruz community, under the leadership of Bill Simpkins and Jim Thoits, proposed replacing the unsightly harbor light with a lighthouse of classic design, adding a little more character to a community renowned for its characters. Fundraising efforts began in earnest, and with the contributions of many people, including a major donation from Charles Walton of Los Gatos, enough money was raised to begin construction of the new lighthouse in 2001. The lighthouse, designed by Mark Mesiti-Miller and constructed by Devcon Construction, Inc., stands 41 ½ feet tall above the level of the west jetty, and 59 ½ feet above the mean low water mark. It weighs 350,000 pounds and is built to withstand a quarter million pounds of wave energy. The construction began with a cylindrical inner core which houses electrical equipment and a circular staircase of forty-two steps which lead to the top of the lighthouse. Surrounding the inner core is a network of reinforcement rods, onto which “shotcrete” was blown and then hand-troweled to form the conical shape. These shotcrete walls are 4 ½ feet thick at the base. Finally, a durable weatherproof white finish was applied to the exterior of the lighthouse and a copper roofed lantern room topped it all off. It was worth the O’Dark Thirty wake up alarm, and drive over the hill I thought.